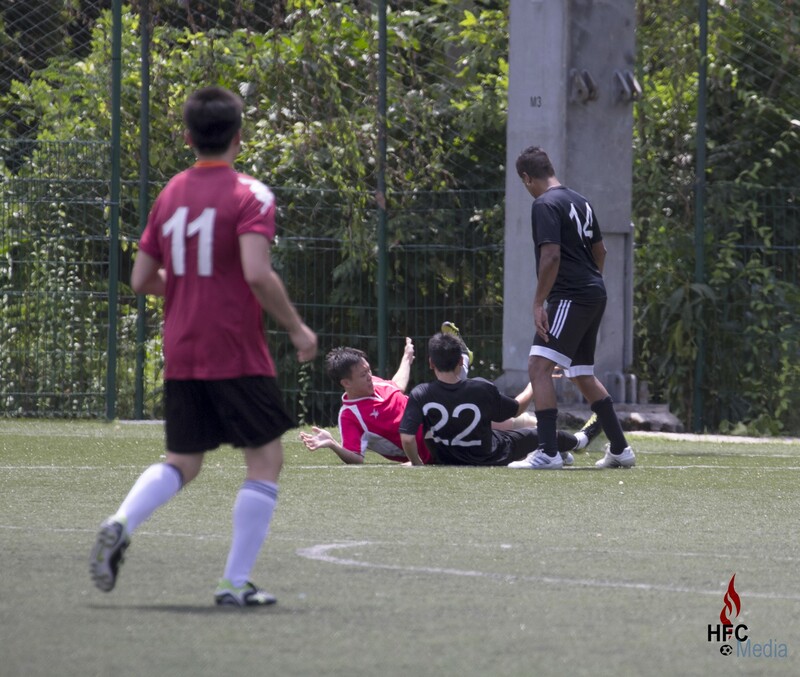 After a month of high intensity fixtures in both the ESPZEN Saturday League and the ESPZEN Saturday Champions Cup, Hilderinc FC were handed a break in their competitive endeavour after the much anticipated clash between them and Pacifier FC was called off at the behest of the latter who decided that they were not ready to face the Blacks just yet. And not wanting a free weekend, especially with league fixtures coming thick and fast from now till the end of the June, the Hilderincs opted for a friendly game instead; a decision they would have thought twice in retrospection considering the ugly end to a game against an opponent who left a bad taste in their mouth. With no more than seven regulars returning to the fold, along with long-time absentees, Nabil Zarif and Riley Aiman, and debutant Hernan Algarra in attendance, the Blacks looked well-stocked for the first time in over a month, when they had to grind out impressive results with limited options. However, with a mid-heavy and bottom light squad, the Hilderincs had to alter their starting lineup to suit the choices available, though they were confident of putting in a good shift on another hot afternoon. Despite a leisured start with both team content to stroll the ball around, the Blacks were inches from the taking the lead inside four minutes when Fehd Marrakchi saw his strike sail past the face of goal after he latched onto Sanil Khatri’s loft before persisting movement into the box. Five minutes later the Hilderincs were presented with another opportunity to take the lead when Mika Michalowski’s hoofed passed was directed against the post by Ian Morris from a tight angle. But it was third time lucky for the Blacks in the 14th minute when Dionisis Kolokotsas’ long pass from inside his own half was turned into the path of Fehd Marrakchi by the defender under the duress from Glenn Sandhu for the Moroccan to register his first goal in his second appearance for the Club, after he had hit the post and assisted a goal in last week’s league win over TGA Strollers. If the opening 30 minutes will be remembered for the positive reasons, with the Hilderincs, on the ascendancy and coming close to extending their lead on a number of occasions to kill off the game as a tie, especially with Hernan Algarra almost making an instant impact with a goal inside 5 seconds of his debut and Nabil Zarif forcing a fine save off the goalkeeper from a freekick, the remaining 10 of the first period descended into a scrappy affair as far as the Blacks were concerned as they allowed the opponents more attention in their half than desired, however, with the backline keeping a tight ship, they took a slender advantage into the break. The restart was a story of discipline taking a back seat as a barefacedly self-professed protagonist, in an otherwise cordial side to that point, deciding to dedicate how matter should be handled, even telling the referee how he should do his job, setting the tone for others to be influenced in less than constructive manner, and failure on the part of the official to effectively put him in his place would lay the foundation for the later fiasco. Unduly taken in by the antics of a handful of undesirables, the Hilderincs had themselves to blame as they started to lose their focus and composure, leaving behind their earlier fluidity and poise for hurried and hasty approach, hence opening themselves to unforces errors and stress, with tensions starting to simmer by the minute. Having forced to make changes just to keep sanity within the ranks, the Blacks, distracted and not fully in tune, unnecessarily allowed the opponents to pull level midway through the second half. The Hilderincs’ response was swift, but they were repeatedly denied by the big goalkeeper who earned his plaudits as he pulled off no less than four saves that were certain goals if not for his true heroics, unlike the purported claims by couple of his delusional team mates. However, there was no one else but themselves to blame for the Blacks’ surrendering of two goals in the closing stages as they undeservingly faltered in sorry game not befitting their stature. In keeping with a regretful theme with certain kinds of teams in Singapore, punches were thrown in an attempt to prove a sense of false bravado, only to be exposed of hoodlum thug-ism no matter what lame justification for such behaviour. In spite of being underserved, Hilderinc Football Club, in keeping with their tradition, still presented their opponents with the usual token of appreciation, which they give to all they play against despite the outcome of the game, even in defeat, but on this occasion, it was against a sincere feeling of reluctance because there was certainly no appreciation for the third grade behaviour of some. Not going to lose any sleep with games like this, the Hilderincs will dust the grime off this episode and focus themselves for the resumption of league duties next Saturday.